In this case primers are not normally suitable. Condensation-curing rubbers normally adhere well if vulcanised on to similar rubbers, provided these are not too old. In the case of addition-curing rubbers, however, special measures have to be taken to achieve adhesion, details of which we will gladly supply on request. If the moulds have to be stuck to a surface, this can be done by using silicone rubber sealant. 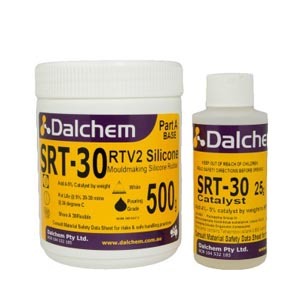 This one-part material is applied to the pre-treated and primed substrate as well as to the clean RTV silicone rubber mould, both parts being brought together immediately. By moving the mould about a bit, one ensures that it is positioned properly. Excess material is removed. Smaller moulds will have bonded satisfactorily already after 1 – 2 hours, but this figure should only be taken as a guide, since relative humidity, mould size and ambient temperature are all relevant. Here, the surfaces to be joined are thinly coated with silicone rubber sealant, the two surfaces being joined immediately. All other details are exactly the same as for bonding cured RTV silicone rubber to other materials.